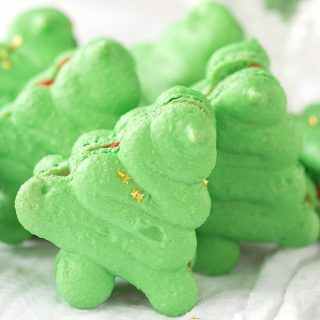 Christmas macarons are light and airy French macarons in the shape of Christmas trees. The macaron filling recipe is red vanilla buttercream frosting. 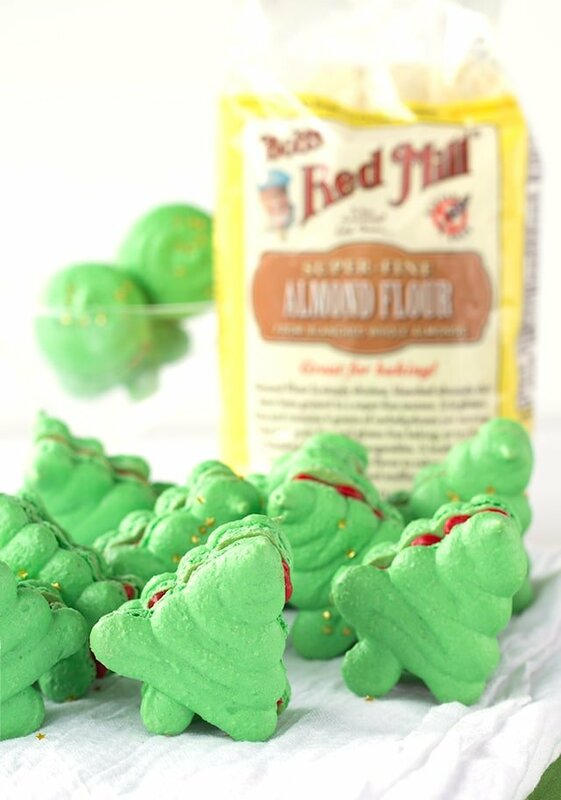 This is sure to become one of your favorite Christmas cookie recipes! There’s nothing more satisfying than having your French macarons come out perfectly, especially when they’re Christmas macarons. The macaron filling recipe for the middle of these gorgeous Christmas trees is a bright red vanilla frosting. You could substitute the vanilla extract for peppermint extract or any other extract for a different flavor, too. I also dug out these cute little edible gold stars from my cake drawers. I had forgotten about them until Wesley, my husband, reminded me. Thank goodness I have him to remind me of most things. I’m one forgetful lady. I’m seriously in love with these macarons. This is honestly one of my favorite Christmas cookie recipes. I think everything is a little more magical when it’s Christmas related. Yeah, I’m one of those crazy Christmas people. I listen to Christmas music every day starting Thanksgiving Day until Christmas. I then pout the day Christmas is here because I have to wait another 11 months to put up all of my decorations back up, watch my movies and listen to my Christmas music. I get crazy about Halloween too, except there’s no pouting on the day of. I’m normally too busy doing last minute touches to Lucian’s homemade costume to pout. The husband does all of the putting together and I do the detailing. It works out perfectly for us. I also get into the creepy stuff year around. I love listening to scary podcasts and watching spooky movies as long as their isn’t too much blood and gore. Wesley thinks I’m strange, but aren’t we all a little strange? I’m just known to own up to it. Anyway, back to these pretty little French macarons. People often wonder, are macarons hard to make? I’m here to tell you that they really aren’t; they just require a little extra patience. I put quite a bit of effort into Christmas macarons recipe for you guys. It’s always a bummer when you can’t recreate a recipe you see and love. So I created a template that you can print out and place underneath the parchment paper as you pipe. You can click the template below and open to print it. Print off two sheets and then just overlap them to cover the entire baking pan. Place a sheet of parchment paper on top of the templates. After all of the Christmas macarons batter is piped on, pull the papers out from underneath the parchment paper. Can you make macarons with all purpose flour? The reason macarons are made with almond flour is because it gives them a much lighter texture, and of course, the classic almond flavor. The Christmas macarons would never rise properly if you use all-purpose flour, so using almond flour is required. Can you make macarons without cream of tartar? While cream of tartar isn’t essential to making French macarons, I use it because it helps to create volume in the egg whites. That volume is very important to making the macarons light and airy. 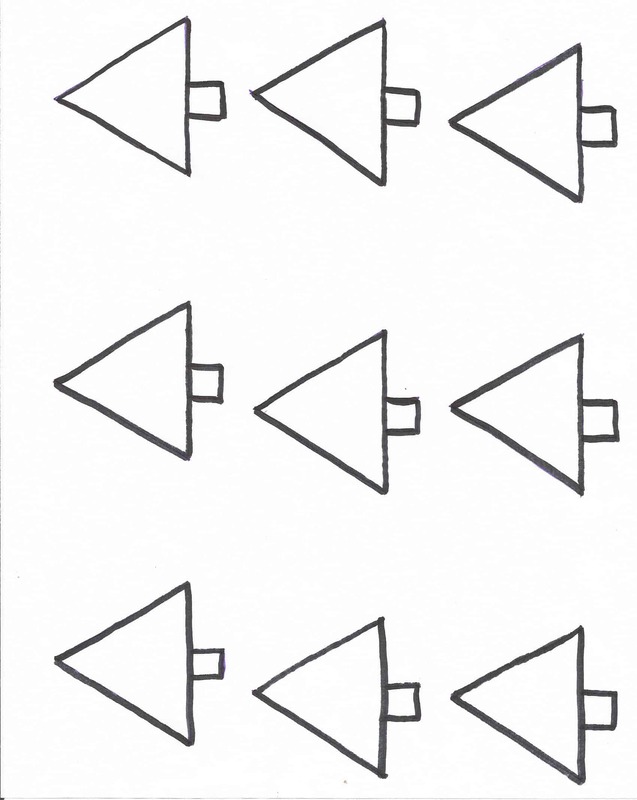 Print out 2 copies of the template above. Line a baking sheet with parchment paper. Line the two templates up underneath of the parchment paper. Sift together the almond flour and powdered sugar. If you can't find almond flour you can always make it with almonds and a food processor. Finely grind the almonds and sift through a fine mesh sifter. Discard or snack on any large pieces. In a large mixing bowl, add in egg whites. Turn on high and beat until the egg whites form a soft peak meringue. Add in the granulated sugar, salt, vanilla extract, and cream of tartar. Mix on high until a stiff peak meringue forms. I slowly but constantly add in the granulated sugar into the meringue instead of tossing it all in at once. Add in the leaf green gel paste color and give it a quick mix to incorporate. Very lightly and carefully fold in a third of the almond flour/powdered sugar into the meringue with a spatula. Repeat with the rest of the almond flour/powdered sugar mixture. All together you'll want to have about 59 turns of this mixture. If you don't mix enough the macaron shell will be extremely fluffy and cracked. If you over mix, the macaron shell will be extremely flat and might not form a foot. Fill a piping bag with the macaron shell filling. I used a #12 wilton tip on the end of my piping bag. Pipe macaron shells on the baking sheet following the christmas tree template. Pipe the trunk first and then start from the bottom of the tree and go back and forth to the very top of it. Watch the video below to get a better idea. Sprinkle a few of the edible golden stars onto the freshly piped macarons. Let the macarons dry until they are no longer tacky to the touch. It will take 20 minutes to 1 hour. Place in the oven for about 10 minutes until they no longer stick to the parchment paper. Let the macaron shells cool. Match the macaron shells together according to size and shapes that best fit together. In a large bowl, add in the butter, powdered sugar, milk, and vanilla. Mix on medium until incorporated. Turn mixer on high and beat for another 1 - 2 minutes until light and fluffy. Add super red gel paste food color to the frosting. Add enough to give a bright red. Stir to incorporate. Be sure to scrape the bottom of the bowl to get all of the food color. Place frosting in a piping bag with a small tip. I think I used a #7 Wilton tip. Pipe the outline of the macarons and fill in the center. Add the top shell. To get a deeper color frosting, make it and color it 2 days ahead of time and let it sit in the fridge. The day you plan on using it, remove it from the fridge and let it come up to room temperature. You can whip it again, but it may lighten the color. It's best if just stirred with a spatula. Bob’s Red Mill sent me product and provided a $100 gift card for my readers in exchange for a post. As always, all opinions are my own. This post contains affiliate links. Cookie Dough and Oven Mitt is a participant in the Amazon Services LLC Associates Program, an affiliate advertising program designed to provide a means for sites to earn advertising fees by advertising and linking to Amazon.com. How do we enter to win the Bob’s Red Mill Gift Card? Oh my gosh, you made trees?!!! They are so cute! I can barely master the little round ones!! Girl, these are adorable! 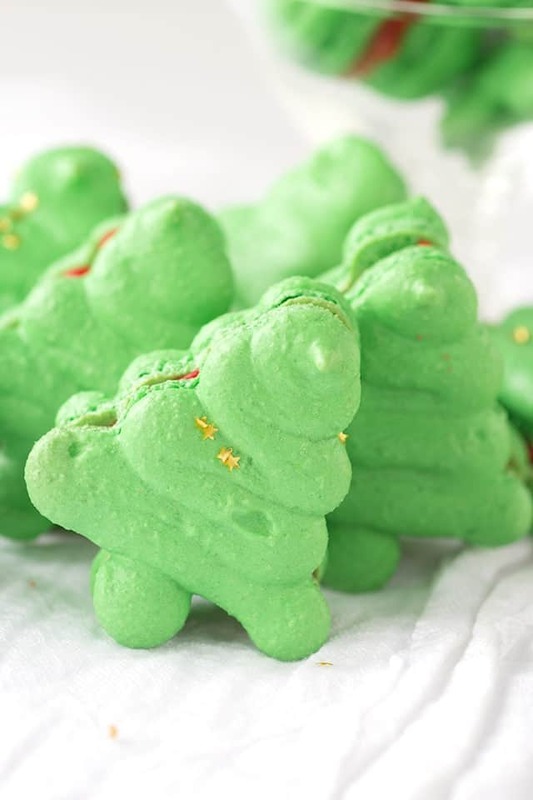 The vast majority of the population has trouble making a regular macaroon, and here you are with this cute Christmas tree one. These are some serious skills. LOVE! They are just amazing, thank you for sharing! If you can, come and join the Holidays Celebration Link Party (http://keepingitrreal.blogspot.com.es/2016/12/holidays-celebration-link-party-4.html) and bring all your holidays posts! I’ve always thought macarons were such fancy cookies, and yet they are so adaptable! Thanks for sharing at Merry Monday!